I like to think of myself as a simple kind of gal. Simple hasn’t always described my life. There was a time when life was complicated and even a bit fake, but two kids, eight chickens, and a bit of maturity have a way of simplifying life. But simple doesn’t mean going without. There are little luxuries I still hold on to in between the seven day nap strike and the chickens squawking outside the back door (we live in the city remember?). An organic milk chocolate bar (I know dark is better for my heart, but milk is my go-to treat), a warm homemade latte, a new cookbook or magazine, homemade foundation powder, a bit of mascara, and a dab of lip balm. Simple essential luxuries. Lip balm tops my list of must-have-essential-luxuries, particularly in the winter when Florida gets down to the chilly 70’s during the day. Parka and boots time! So when Dustin and I decided to head to Chicago earlier this week for a much needed vacation (the first vacation alone in five years), I knew lip balm was a top priority for this Florida gal. And boy was I right. The weather here in Chicago has been down right frigid and my lips have been desperate for moisture. 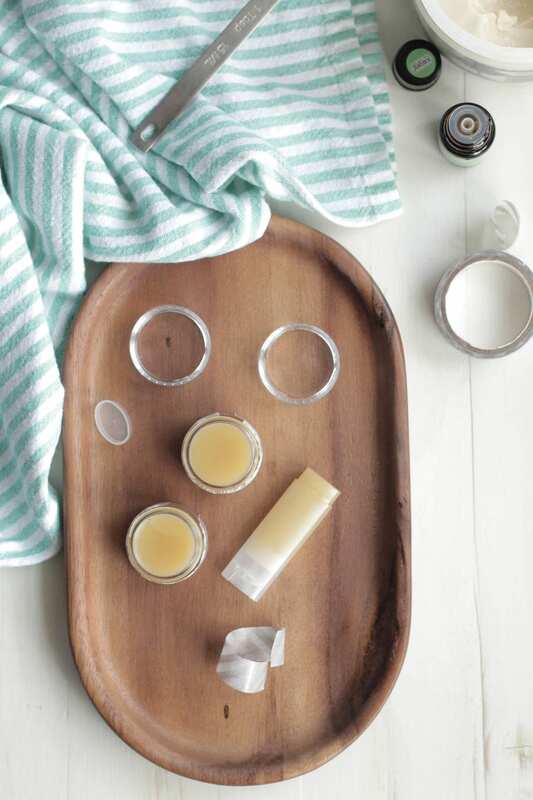 Homemade lip balm is so simple to make it takes just minutes to make multiple jars. 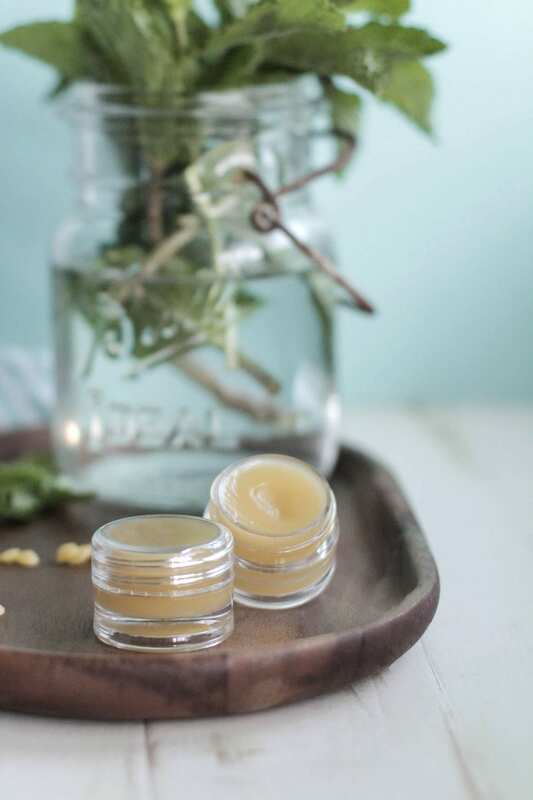 Homemade lip balm is also super versatile, as it can be used for both lotion or face moisturizer when times are desperate or you’re just really into multi-purpose DIYs. Either way, it works! 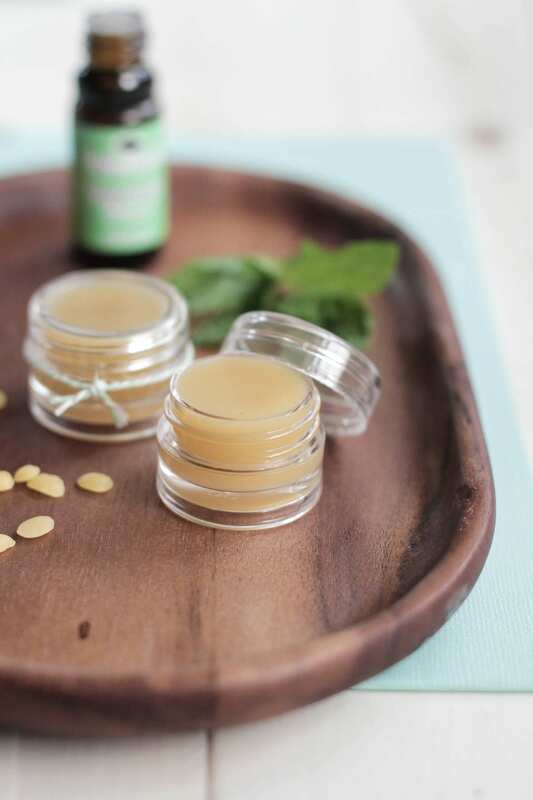 The minty scent from this lip balm comes from peppermint essential oil which means homemade peppermint lip balm can also be applied to the head or temples when a headache strikes. Headache gone. Voila! 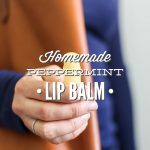 Homemade lip balm makes the perfect stocking stuffer and gift, leaving family quite impressed at your ability to create homemade products (don’t forget the vanilla extract too!). 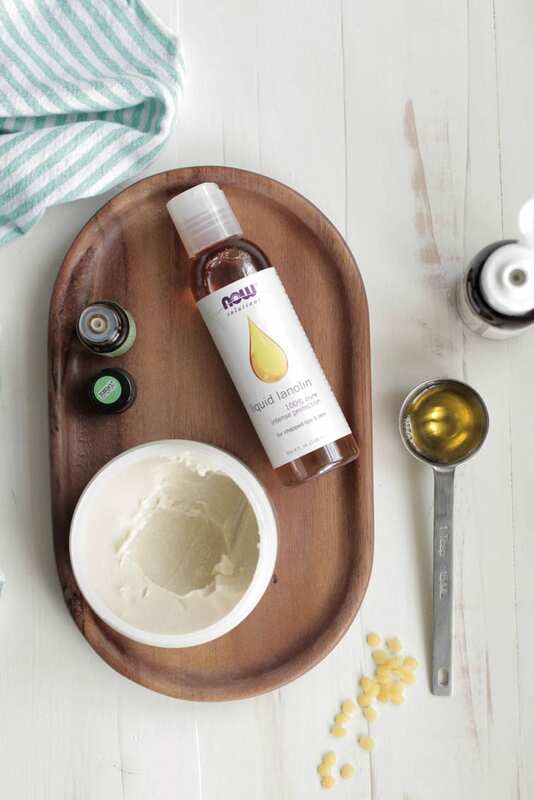 2 TB jojoba oil coconut, apricot, avocado, sweet almond, or another nourishing oil will also work. I keep jojoba oil on hand for cleaning my face and homemade lotion. In a glass bowl, combine the shea butter and beeswax. Place the glass bowl on top of a saucepan partially filled with water over medium heat. Heat until the beeswax is melted, stirring occasionally. Turn off the heat and remove the bowl from the pot. Add the jojoba oil, lanolin, and essential oil. As the mixture cools, the lip balm will set, so it's important to work quickly. Pour the mixture into lip balm containers (I like these) and allow to sit for a few minutes until formed. *Lanolin adds extra moisture to this lip balm, but can be substituted with vitamin E if desired. 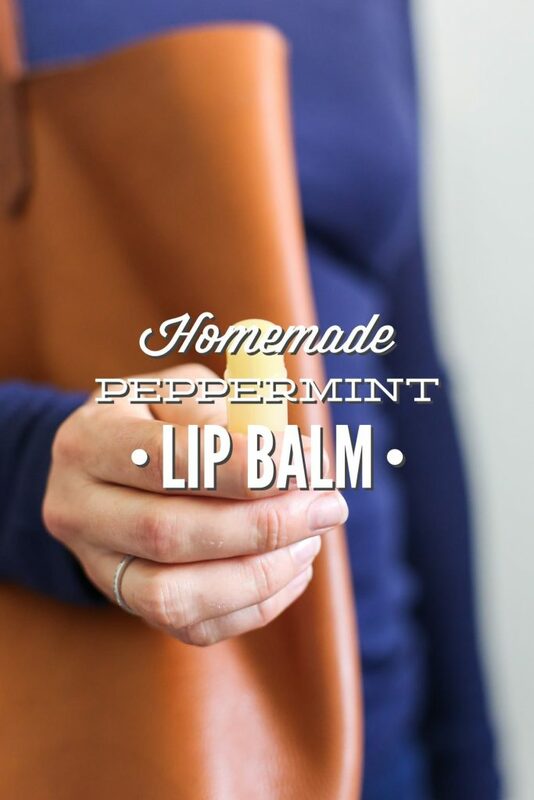 This recipe makes 6-8 peppermint lip balms, depending on the size of your container. Just wrapped up a batch! I used 20 drops of peppermint and it has the perfect tingle. I’m excited to see how they are! This was enough for me to fill eight white circular Chapstick containers. I also had a bit left over that I used to top off some chapsticks around my house. Do you happen to know if this recipe sets up harder or softer? My husband keeps Chapstick in his pocket and I don’t want it to melt. 😉 Thanks for yet another great DIY recipe that works! Hey Emma, That’s awesome! Congrats!! This recipe tends to be softer, more “spreadable”, but not meltable ;). If that makes sense. I live in Florida and have left this lip-balm in my car many days. It definitely gets soft, but won’t melt (unless the temp is super super super hot) and firms back up inside. You can add more beeswax to the recipe (about 1 tsp to make it harder). Dear Madam as I live in the UK and i have been looking at your website about making lip balm, it mentions TB is that Table Spoon? I would be very grateful if you could answer this for me! Hey Terry, TB = Tablespoons :). I would like to make this recipe without animal ingredients. Do you know what I can replace the beeswax pellets with & the lanolin? If so, do you happen to know what the amounts would be of the alternative ingredients for these 2 items? Hey Ashley, The beeswax really can’t be replaced. Beeswax is what causes the recipe to harden, creating a firm lip balm. I’m sorry :(. The lanolin could be replaced with vitamin E, it won’t be as nourishing on harsh winter days, but will still provide moisture. Wow! I didn’t know that, Olivia. Thank you for sharing! Hello! I love the simplicity of your recipes! Thank ypu for making them easy! I was wondering if you would know this: i saw a honey milk chapstick that looked great but when i can’t read half the ingredients in it i want to make it myself, what would i sub out for honey and non fat milk powder? I would not put in the peppermint oil…would that be the honey part? Hope this makes sense, thank you! Hey Denise, It’s been on my list to try a honey lip balm! I would add 1 teaspoon of honey, melting it down with the shea and other ingredients. I’m not sure about the milk. I would tend to use coconut milk, but I’d be afraid of the milk going bad. 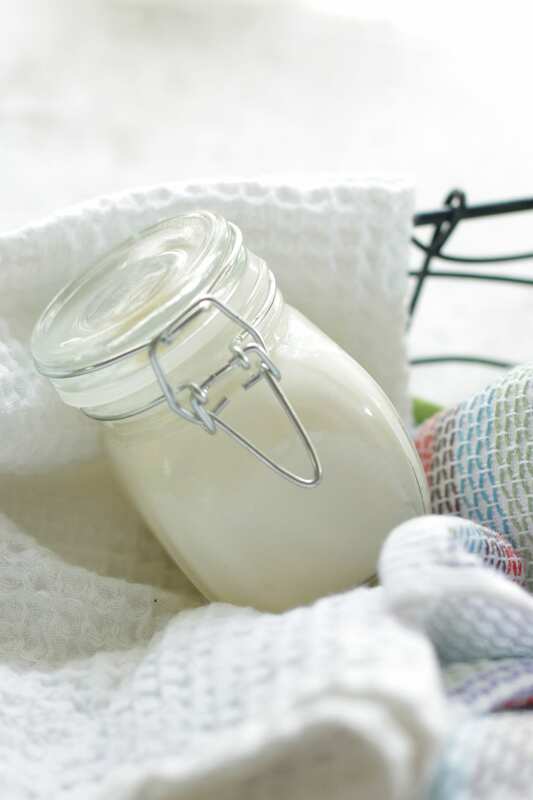 Hey Cate, You can find my sunscreen recipe here: https://livesimply.me/2014/06/05/homemade-sunscreen-recipe/. I am always admiring & wondering where you find all the wooden items you use in your photographs. Such as this oval wooden tray. The wooden scoops, little wooden spoons. I also like the small brush you used in your foundation post. You always have such cute little bowls & measuring cups. May I ask where you find all these items from? Thank you very much. I love unique bowls, jars, and spoons. I find most of my collection at HomeGoods, Target, or Pier 1 Imports. The HomeGoods selection changes frequently, so it’s best to check once a month for new items and most of the time they are very inexpensive. Hi Kristin: Would using cocoa butter instead of shea butter produce the same result in the balm? Or do I have to adjust the measurement? Hey Cece, You can substitute the cocoa butter 1:1 in this recipe. Cooca butter will be a wonderful replacement for the shea butter!! Fabulous, thank you!! 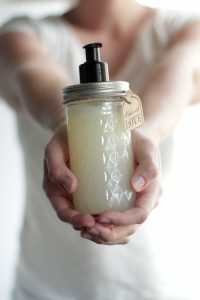 I also wanted to mention that I have made a few DIY beauty products and loved them all. Many blessings! You’re very welcome, Cece :). 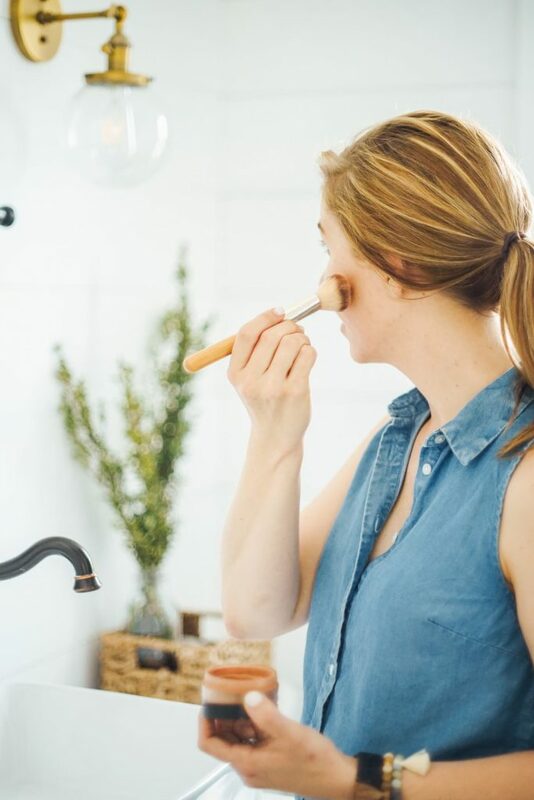 I love that you’ve been making homemade beauty products and loving them…great job! About two weeks after I made this lip balm, it developed a gritty texture. Any clues as to why this may have happened? Thanks!! Hey Crystal, I think the shea butter is probably the culprit for the gritty texture. There are times when a “butter” can result in a gritty texture if it was quickly heated and cooled. One way to prevent this in the future with a shea butter product is to heat the butter for a bit longer (10-15 minutes) over low heat (before adding heat sensitive ingredients) to avoid crystallization later on. I made this and loved it at first. It was creamy and beautiful. Only a couple of days later though, I found it started to go really grainy. Is there any adjustments I can make to stop this from happening? Hey Linda, Another person just commented that the same thing happened to her lip balm. I believe the answer is to heat the shea butter for a bit longer- 10 minutes or so. Then proceed on with the directions :). I made n m using face serum , like it. I have one request, can u do a diy on hair conditioner n mask that helps stopping hair fall. Hey Veronicadg, I’m so glad you’re enjoying the DIYs. I’ll work on a hair conditioner and mask :). Hi, i was wondering where you got your lip balm tubes (the square looking one) in the photo? i noticed that you didn’t link it. Hey Mia, The square-looking tube came from a local herbal store in my area. Hey Cheryl, I don’t have a recipe on Live Simply, but EveryDay Roots shared great tips: http://everydayroots.com/athletes-foot-remedies. Hey, first I’d like to say I love your site and am working more DIY products into my everyday life so your blog is a godsend! Second, I love lip balm but I usually buy the more glossy/gelly types like Carmex and so I was wondering if this recipe would be fine in containers like this: http://www.amazon.com/Empty-Tubes-Gloss-Cosmetic-Containers/dp/B00N73MGEK/ref=sr_1_7?ie=UTF8&qid=1448248498&sr=8-7&keywords=empty+lip+gloss+containers and if not, do you have any suggestions to make the recipe more gel-like? Hey Alexa, I’m not 100% sure the recipe will work in those containers, but it’s worth a shot! You could try using castor oil for a nice shine, too. I’m so glad you’re enjoying Live Simply, thank you! This is so silky and lovely. I’ll never buy chapstick again! Yay! 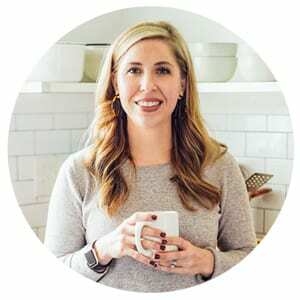 I love your recipes for DIYs, real food, and cleaning. Basically your whole livesimply web site. I was just wondering when you make this lip balm is it sticky with the lanolin in it. Hi Kristin! I’m really enjoying all these DIY ideas an i plan on making this lip balm. Was wondering if there are any other essential oils other than peppermint that i could use? Hey Tina, You could try sweet orange, lavender, or just a drop of clove (this is a warm oil, so it’s important not to overuse it). Kristin i made a batch of lip balm yesterday. Had to order peppermint oil so in the meantime i substitutes spearmint although a few less drops. Awesomecresult ! Do you have an alternate source of shea butter? I bought some from the link in the recipe and it was not very nice. Of course, the recipe is from a few years ago and things change. I’m really looking forward to making the lip balm. Thanks for any help! Hey Laura, I still recommend Better Shea Butter (the linked to produce) unless they just recently (as in the last month) changed their source/product. I’ll have to purchase another batch and see if it’s different than the last one I ordered. It’s usually a great product, so I would definitely contact the company and ask for an exchange/return–they generally stand by their products so I bet they’ll make things right for you. My other source for shea butter is Plant Therapy (available from their website). I just made a batch of this lip balm today. I used 3 tsps of beeswax as you suggested and it set pretty solid for the white tubes. I’m loving the peppermint flavor and smell. My lips feel amazingly soft. I don’t think i have ever gotten even from any store bought lip balm. I will definitely continue making this one. Awesome, Usha! I’m so glad you’re enjoying it! Hey JYARCHNA, I haven’t had great success with adding color to homemade lip balm. I recommended purchasing colored lip balm from a company making more natural products. 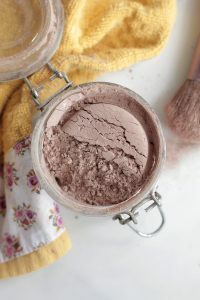 I just found this recipe after printing off your foundation powder recipe. I can’t wait to make that! I am searching for a replacement for Avon’s Care Deeply lip balm. The hard thing is that is the perfect level of moisture for my lips. They get really dry and don’t like most lipsticks (even the expensive lines), but one problem at a time. I would be making this for family members, also, and one is allergic to wool. Long ago the doctor told her to avoid Lanolin because of this. I have Vitamin E oil, but can”t sacrifice the moisture level! would I be able to use both lanolin and vitamin E? Hey Leah, Sure, in a small amount. Hi How would you color a lip balm IE pink tint.